Boomboxes have been in use for many years. They’ve undergone many changes to match with the advancing technology in sound systems. Today, they’re compact, more portable, and come with wireless features. Nowadays, most people use them as Bluetooth speakers and MP3 players. However, there’re still many people who use them to listen to their favorite radio stations. The downside is that most modern boomboxes don’t have an antenna while others have a small antenna. Thus, the audio quality of FM radio is often poor. Luckily, it’s possible to fix the antenna for better signal and clarity. Read on for the top tips on improving the FM antenna signal of your boombox. 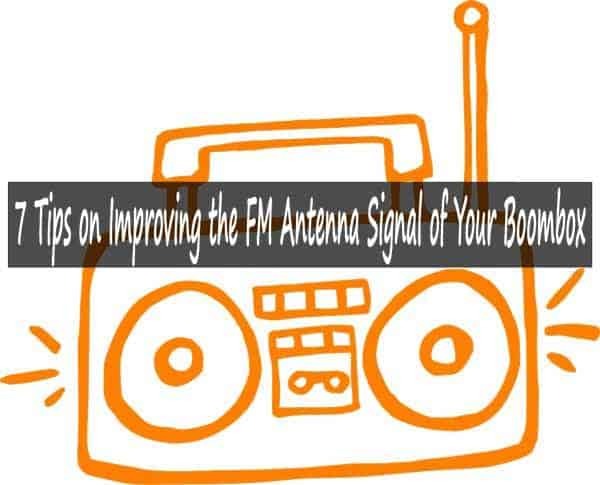 Before discussing how to improve the antenna of your FM radio, it’ll help talking about the basics of FM radio. Basically, FM is an abbreviation for frequency modulation. This type of sound signal is transmitted through changing frequency. This frequency has fewer amplitude changes. Thus, the frequency offers cleaner audio signals. This guarantees a smooth transition between different channels without static noise. However, these signals are prone to physical barriers such as walls. Thus, when listening to radio indoors using a boombox, its reception may be a bit poor especially if it does not come with an antenna or when the antenna is short or poor in quality. How Does An Antenna Affect FM Radio? Antennas are mostly found in older stereo systems and cars. They come in different designs and sizes. The type of antenna to choose depends on the frequency in your area. The basic function of an antenna is collecting radio signals. It attracts radio frequencies that a radio tuner is trying to capture. However, most designs of today’s stereo systems do not focus much on radio but newer technologies such as Bluetooth and USB. Thus, their radio signal reception is often weak. Adding physical barriers may render the radio useless. What would you do when you’ve already bought a boombox but its radio reception is poor? Here’s what to do. In case you love fixing broken music systems or adding more features to an already good system, then you’ll obviously enjoy fixing the radio reception quality of your boombox. Try these tips and see which will work for you. Tip 1: In case your boombox did not come with an antenna, then you need to buy one. Basically, a standard dipole aerial will work. Check your boombox for an aerial input. Connect the new aerial to the input. Since FM signals are directional, reposition the antenna until you receive all the radio stations you need. Today, most antennas are rotatable, thus you’ll find it easy to reposition it. Tip 2: If you have attached a new antenna and it fails to work like how you expected it, then you’ll need to try an amplified indoor aerial. An amplified one has enhanced signal reception capabilities than a standard type. It’s able to receive signals where a standard one fails. You can buy one from your local shop or an online store. It will help if you can get one with a return guarantee in case it doesn’t solve the problem. Tip 3: Another reason for poor signal reception may be living far from the radio transmitter. In case you’re in this situation, then you can install an outdoor antenna. Try to mount it at the highest point possible. You can fix it on a lengthy pole for better signal reception. You can get an aerial that can receive signals from different directions since it will point towards different transmitters. This way, you’ll receive more radio stations. Tip 4: No antenna? No problem. It’s not a must to buy a new antenna. You can easily make a DIY aerial. It can work well just like a brand new one. Any type of wire can be used as an aerial without much difficulty. Any thick or thin wire will do. Preferable get a wire that has a plastic coating for safety. However, a bare wire can still work. Simply attach the wire on the terminal of the antenna. Then run the wire through the window and ensure the end hangs outside. The higher you place it, the better. Once done, tune the radio and see whether the signal quality improves. Tips 5: While some boomboxes have an antenna input at the back, others don’t have one. In this case, the headphone jack may work as an aerial. If this is the case, you can try to plug in any 3.5mm cable into your boombox and tune the radio. A longer cable will offer better reception quality than a shorter one. Tip 6: In other boomboxes, the power cable works as an antenna receiver. You can try to stretch it long and reposition it to check whether the signal improves. In case the cable is extremely short, look for a longer cable and check whether it’ll work better. Tip 7: In case you’re getting distorted reception, may be you’re using the radio in a room surrounded by many physical barriers. Try placing it near a window or door and check whether the signal improves. While most of these tips may work, if by any chance you still fail to get a better signal for your FM radio, you can read our review of the best boomboxes. By investing in a high quality boombox, you’ll never have to struggle about its FM signal quality.